We’ve tackled organizing your work bench previously, but there’s another important aspect of tool organization that doesn’t get as much attention – organizing your storage cabinet. Depending on the design of your cabinet, you might have room for smaller tools such as wrenches and screwdrivers alongside the larger tools such as power drills and so on. The best way to start with arranging these is to decide which of them you use more and which you don’t call upon as often. Keep the ones you use more on higher shelves, above waist-high or so, to provide easier access to the tools you need most while keeping your less-visited equipment organized and available. It might sound a little obvious, but you’d be surprised how many cabinets wind up becoming a huge pile of pliers and hammers. After you determine which tools you need most often, organize them more specifically by type or style. Keep standard wrenches away from metric, for example, or separate your Phillips-head screwdrivers from your flatheads for easier access. 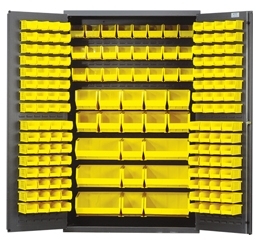 On a bigger scale, labeling or indicating what each cabinet contains (if you have multiples) will also prove handy – you don’t need to be opening the cabinet containing your shop jackets when you need to find a wrench, after all. Further storage inside your cabinet, if you have the room, can free up a lot more space than you might expect. Installing pegboards on the back wall of the cabinet can free up shelf space and keep your bulkier tools suspended over the smaller items. If you’re feeling adventurous, you can carve some shadowing foam to give your tools a low-profile place to sit that you know they’ll always fit in perfectly. Or, if you’d rather not make it yourself (or simply have too many small pieces to effectively shadow), there’s always the standby of storage bins to keep everything together and de-cluttered. These tips may work better or not as well for some of you depending on the layout of your storage cabinets, but they’re a good place to start – and you’ll notice the differences right away!